Residing on Starnes Street in Augusta, Richmond County, GA in 1930 was the BARKER Family. They are found in the 1930 U.S. Census records. Census records are interesting reading; mostly fact interspersed with tidbits of fiction. The head of the household was William W. (Washington) BARKER at age 32. ‘M’ stands for male and the number ’19’ on his line of information tells his age when he married. He worked as a ‘Car Inspector’ for the Railroad. Essie E. (‘E’ is really Lee) BARKER is William’s wife, age 35 and married at age 22 according to the record but she was actually 25 years old when she married . . . but who’s counting? Daughter Evelyn BARKER is 8 years old in this census. William and Essie lived at the Starnes Street house until about 1960 and Evelyn lived there for her entire childhood. Just a Match Book, or More? This is a matchbook that Charles HOPKINS‘ place of employment, “The Independent Life & Accident Insurance Company” used for years. They must have made a few gazillion of them with half of that gazillion in our house. It’s amazing how strong memories develop from childhood. Smells and visual icons are like time machines for me, traversing years in mere seconds. I’d never seen the Statue of Liberty but that was no reason for me not to know who she was. Everyone knows her. And even though the company was headquartered in Jacksonville Florida instead of New York, that was no reason not to use her as the main icon for the company. 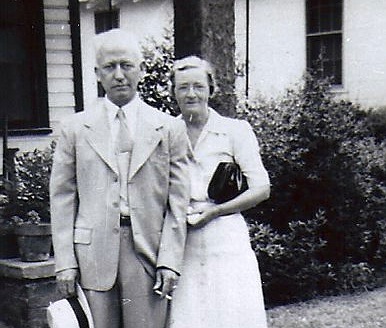 The Curtain Closes – What Happened to James & Clary DICKERSON? James probably never considered that his 12 letters written in 1862 would be shared and read by his descendants. They were not meant for us but we have gleaned so much from his correspondence to his wife. Understanding and forgiveness appear in Letter 11. The realities of war are described and as ever, James has a keen sensitivity to crops and prices of goods in the area. He still has no money and is concerned about his family having shoes. The last letter, number 12 is penned by someone other than James due to his injury. He is in a Confederate Hospital in Richmond, VA.
What Else Happened in 1862? The first income tax was implemented; 3% of incomes less than $600. Paper money called ‘greenbacks’ were issued to the United States by President Abraham Lincoln. The United States Mint was established by Congress in Denver CO.
Bucharest was proclaimed the capitol of Romania. Julia Howe published “Battle Hymn of the Republic”. The U.S. Navy’s first ironclad ship was launched and in the same year their ironclad ship ‘Monitor’ sank off Cape Hatteras, N.C.
Emancipation Proclamation was issued by Abraham Lincoln, freeing slaves in the U.S. The Battle of Antietam was fought and was the single most deadly day of the Civil War with 23,110 casualties. 1st pasteuriztion test completed by Louis Pasteur and Claude Bernard. The bowling ball was invented. In Letter 9, James wants information from Clary to change his situation in the military stating that he ‘can’t live this life’. His possesions include a blanket, napsack and discarded knife. In Letter 10 the strain of separation from his wife is manifest. It would be so interesting to know what Clary said in her letter dated June 4th. We can only imagine it expressed displeasure and some distrust after Letter 5 where James wrote about the women he had seen and his desire to go fishing with Clary. James ends letter 10 rather cold and business like. Wiley is James’ younger brother born 8 Oct 1835. He enlisted in the 32nd Confederate Infantry Regiment, Company H.
 J. Grant is probably J.L. Grant found living in Proctor, Monroe County, GA at the time of the 1860 census. He was born about 1825, was married and had 5 children. Any Brown is most likely Andrew J. 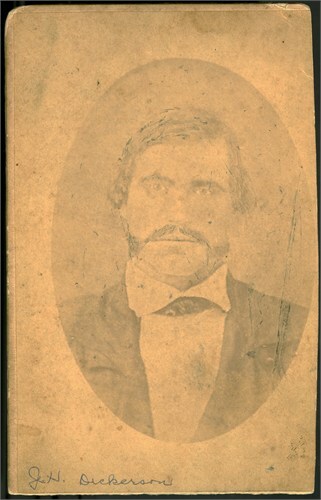 Brown who enlisted in Company H of the 32nd GA Infantry Regiment on 6 May 1862 just as Wiley DICKERSON. 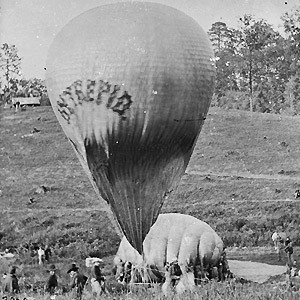 Union army balloons were a common site in the Richmond area. The ‘Gazelle’ and ‘Intrepid’ were two balloons used at this time. We are in the 150th anniversary of the Civil War 1861-1865. There are many events commemorating this piece of history coming up in the next year or two. Many of our kindred dead were involved in this war. It’s a great opportunity to enrich your lives while the anniversary is being observed. 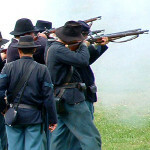 You might find something of interest by looking at the Civil War Sesquincentennial Events site. Just enter a state to see if anything is happening where you’re at. For instance, this summer on July 28th there is an Artillery Demonstration at Kennesaw Mountain National Park, just northwest of Atlanta. The Kennesaw Mountain Website posts tidbits of facts named “Did You Know”. An example of one is below. Did You Know – Confederate armies were usually named for states or regions where they campaigned, while union armies were named after major rivers. Thus the Confederate Army of Tennessee opposed to the Union Army of the Tennessee.